Of all the great names associated with ice dance over the last fifty years, few inspire more reverence than those of Jane Torvill and Christopher Dean. The couple from Nottingham in the English Midlands will best be remembered for their ground-breaking performance at the 1984 Winter Games in Sarajevo, when the pair triumphed with near perfect scores. Dean's influence at the highest levels of the sport runs deeper than that. His importance can perhaps best be illustrated by the impact he and his partner had on the Soviet dynasty which had reigned imperiously over on the discipline for the previous decade and more. In short, from the moment Torvill and Dean won their first European title at Innsbruck in 1981, there was no more dynasty. Russian classicism, a product of the Bolshoi and Kirov ballet traditions, was blown away by a storm of originality and invention whipped up by the Englishman that turned the entire ice dance edifice on its head. Mack and Mabel in 1982, Barnum in 1983...Dean's choreographical magic sent the couple off on mesmerizing explorations of the rink in a whirl of perfectly calculated movement, all speed and synchronization, emotion and grace. But the couple saved their greatest triumph for Sarajevo. After a performance inspired by Ravel's Bolero and executed with rare emotion and skill, the pair were awarded nine perfect 6.0 scores by the judges, who had clearly realised that they had witnessed a performance of rare artistic perfection. And yet, when the couple first came together in 1975, there was no real evidence to suggest that they would leave such an indelible mark on the sporting world. Dean was a trainee policeman and Torvill worked for an insurance company at the time, and had it not been for a grant of 14,000 pounds (19,800 dollars) from Nottingham city council that gave the couple some measure of financial leeway, the fairy-tale could easily have been substituted for a run-of-the-mill story of a yet another couple that almost made good. Instead, there was Sarajevo, and more besides. The couple turned professional after 1984, with Dean concentrating on his gifts as a choreographer with the French pair, Paul and Isabelle Duchesnay and helping them to a silver medal at the Albertville Games in 1992. Dean was briefly married to Isabelle, but the relationship did not last long and in 1993 he was married for a second time to the American former figure skater, Jill Trenary. 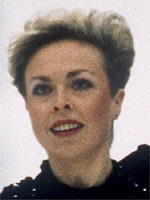 Torvill meanwhile married a musician who worked alongside singer and pop star Phil Collins. In 1993, Dean convinced Torvill to return to the amateur circuit with him and in 1994 they won the European championships for the fourth time before taking the bronze medal at the Lillehammer Games with a performance many in the crowd thought deserved a greater reward. In 2006 the two began to host a hugely successful television series, 'Dancing on Ice', where they train celebrities and get audiences of up to 12 million in the U.K., around half the amount of British viewers who witnessed their Sarajevo triumph of 12 perfect sixes in 1984.